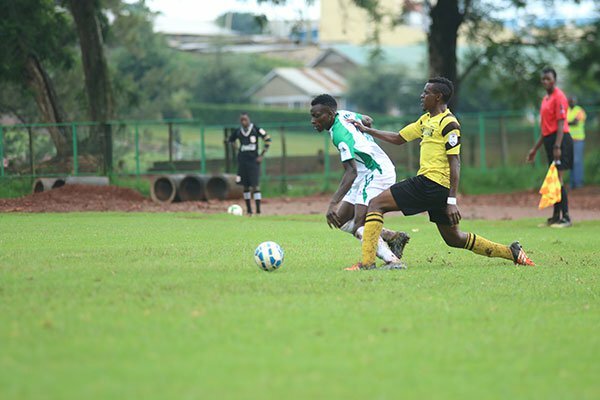 It was a second straight draw for Kogalo as Mathare scored a late goal to force a 2-2 draw. MACHAKOS, Kenya, Apr 29- Clifford Alwanga stepped off the bench to score the equalizer as Mathare United held defending champions Gor Mahia to a 2-2 draw in a top of the table Kenyan Premier League clash at the Kenyatta Stadium in Machakos. 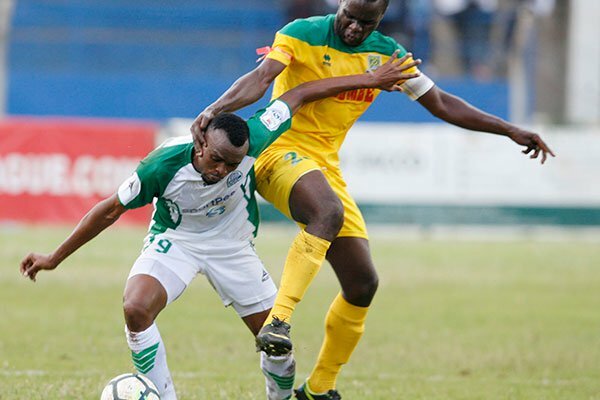 Jack Tuyisenge’s brace had put Gor Mahia clear after Francis Omondi’s opener, but a much changed second half Mathare ensured they come off two back to back losses to pick a point that sees them retain the three-point gap between them and the leaders. This is the second consecutive 2-2 draw from the defending champions who were held to a similar score-line in midweek away to Chemelil Sugar. A frantic two minutes saw two goals scored in either end of the pitch. First, Mathare broke the deadlock in the 16th minute though Francis Omondi whose freekick from the edge of the box after Cliff Nyakeya was fouled went beneath the wall and beat Shabaan Odhoji. From the restart, K’Ogalo equalized immediately this time from the penalty spot, Tuyisenge taking responsibility after he had been hacked down by David Owino. Though Robert Mboya had a touch on the ball, the power was too much as it dropped inside the net. Almost immediately after drawing level, Gor should have gone up when Tuyisenge’s touch off a George ‘Blackberry’ Odhiambo cross from the left failed to direct the ball on target with only the keeper to beat. Mathare’s tact was to sit back, soak in the pressure and hit on the counter using the pace of Cliff Nyakeya and Samuel Ndung’u on either win, but Gor had done their work right and ensured minimal balls landed on the flanks. Gilbert Onsonga, making his first start of the season ahead of injured skipper George Owino had a torrid evening and was often caught off his guard by the dangerous Gor attack led by Tuyisenge and Meddie Kagere. On the half hour mark, Ondonga failed to head away a freekick from Harun Shakava which landed on Humphrey Mieno’s feet, but the midfielder’s effort at swinging on a half volley on his second touch went over. K’Ogalo went into the lead five minutes to the break through Tuyisenge who slammed the ball home after Omurwa had cleared a Kagere effort off the line. Keeper Robert Mboya had failed to hold on to a cross from the right and Kagere picked up, dribbling past the custodian but his effort was blocked by Omurwa a few yards from goal with Mboya way off his line. Mathare came back into the second half an improved side, partly thanks to some tactical switches made by head coach Francis Kimanzi. The error prone Onsongo was moved to right back with Olwande dropping into central defense. Ndung’u was also brought off for Clifford Alwanga, a change that saw Chris Ochieng move out wide while Alwanga came into central attack. The Slum Boys had two back to back chances, first David Owino’s shot from the right hitting the side netting after Chris Oduor beat Odhoji to the ball and set up his mate. After that, Ochieng had an effort come off the bar when he raced into a delicious cross from the right with the Gor backline found sleeping. Mathare kept exerting pressure on the league leaders and they had another chance when Omondi’s freekick this time from range was well tipped over the bar for a corner by Odhoji. Onsonga was ultimately hauled off with natural right back Martin Ongori coming on as Kimanzi sought to rectify the pre-match error. All this time, Gor had been pushed back by Mathare, but they had a chance off the break when substitute Samuel Onyango was played throygh by Kahata but his shot was saved by Mboya. After surviving, Mathare exerted the pressure and Alwanga drew the sides level with a one time finish inside the box off an Ongori cross. This had come just a minute after keeper Odhoji had made a brilliant save to parry away an effort from Edward Seda. Gor Mahia may be forced to play some of their Caf Confederation Cup matches outside the country should Kasarani not be ready in the next three weeks. At the moment, there is no standard pitch in Kenyan to host a continental assignment following a stringent of regulations issued by Caf. 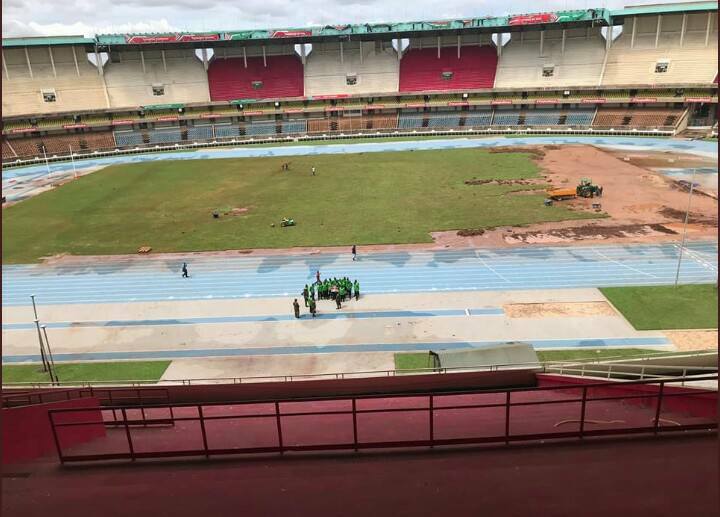 Caf has ruled out Kenyatta Stadium from hosting any of the Group stage matches on security grounds and with Nyayo and Kasarani still under renovation, Gor Mahia may be forced to look for alternative venues, possibly in Rwanda, Tanzania or even Uganda to stage their home ties. “For preliminary matches, it could suffice, but at this stage, it is out of the question, as it does not have some of the requirements. Should Kasarani not be ready, then we will have no choice but to play some of our home matches either in Kigali, Algeria or Dar-es-Salaam,” Gor Mahia Chief Executive Lodvick Aduda told the Standard. The work at Kasarani was initially set to be completed at the end of March but Kenya’s biggest stadium is yet to be opened. Gor Mahia’s Ugandan utility player Godfrey Walusimbi could be eligible for selection this weekend when Kogalo take on Mathare United. “We had solved that issue way before and the only thing that was remaining was actualizing. 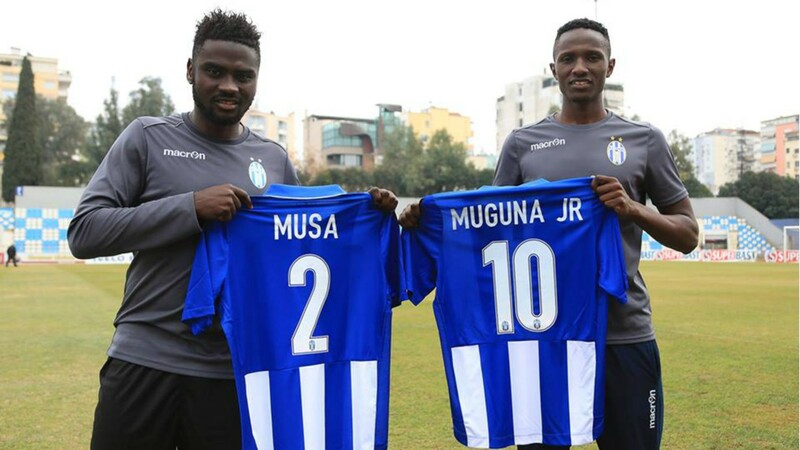 That has already been done so he should be able to go back to training now,” CEO Omondi Aduda said according to michezoafrika. 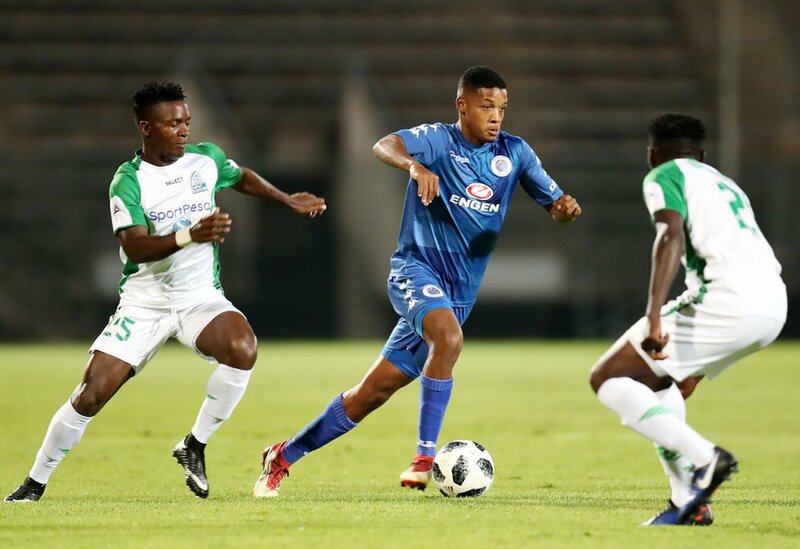 Walusimbi’s absence has been felt in the matches against Esperance and Supersport where his presence would have made a significant difference. “Would things have been different if he was around? Maybe yes, maybe now. But I want to have my best players available. Walusimbi is important to us and we want to have our best players for important games,” Kerr told michezoafrika. Walusimbi’d absence has caused headaches to coach Kerr given the absence due to injury of Karim Nizigiyimana and Wellington Ochieng. Gor Mahia let a two goal lead slip and were held 2-2 by Chemelil. The match was played at Kericho Green stadium on Wednesday. 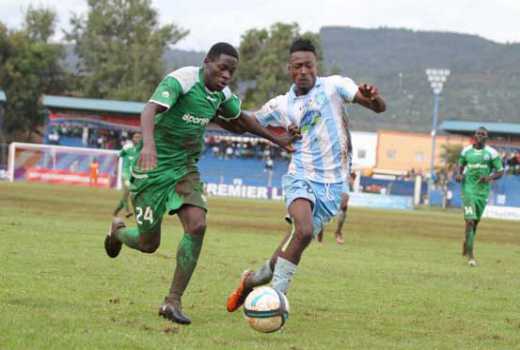 Chemelil Sugar rallied from two goals down to hold 10-man Gor Mahia 2-2 in a Kenyan Premier League match at rain drenched Kericho Green Stadium on Wednesday. The defending champions looked to be cruising as Humphrey Mieno and Ephrem Guikan put K’Ogalo in charge at half time. However, the sugar millers capitalised on Gor keeper Boniface Olouch’s sending off in the 54th minute after handling the ball outside his area, with Charles Kwakha and Benedicto Mwamlangara scoring to restore parity. Gor, who reclaimed top spot on Sunday following a 5-2 demolition over Thika United, have now accumulated 26 points from 10 matches and still have two games in hand over second placed Mathare United who are on 23 points. Chemelil coach Charles Odera hailed his side’s fighting spirit after falling two goals down. His side are now on 18 points. “We were down by two goals at halftime but we played well in the second half and managed to fight back. We had very few chances, but I am happy the boys capitalised on them and saved the point,” he said on Wednesday. Humphrey Mieno opened the scoring for the defending champions three minutes into play, when he tapped from close range after connecting well with Ernest Wendo’s dangerous cross inside the box. Six minutes later, Guikan was on the offensive in the left wing but he was flagged offside before he made a shot at goal. The hosts then managed to cut through Gor’s defence minutes later but Collins Neto was denied by the safe hands of Boniface Oluoch with Maxwell Onyango’s rebound failing to find the back of the net. After missing two successive open scoring chances, Guikan finally got his name on the score sheet in the 26th minute with an easy finish, when he found himself unmarked inside Chemelil’s box with Innocent Wafula providing the assist. Attacker Francis Kahata drove a dangerous shot on target but it was comfortably claimed by Chemelil’s goalkeeper John Waw. Chemelil gained some momentum in the dying minutes of the first half, launching two attacks through Faraj Ominde, but Oluoch was alert. The hosts improved in the second half making the first attempt at goal through Neto, but his short went wide. The game’s turning point came in the 54th minute when Gor keeper Oluoch was sent off after he handled the ball outside the box. Gor coach Dylan Kerr sacrificed scorer Guikan as second choice keeper Peter Odhiambo took his place. The numerical advantage seemed to have have favoured the hosts with wave of attacks on the K’Ogalo goal. Their efforts bore fruit in the 69th minute when substitute Charles Kwakha found the back of the net with a low drive from outside the box to reduce the deficit. Kerr made changes to his team bringing in Samuel Onyango for Ernest Wendo and Lawrence Juma for Jacques Tuyisenge, while Odera brought on Philip Muchoma for Yusuf Juma. Benedicto Mwamlangara levelled matters in the 75th minute with a top corner goal after being set by Nicholas Akoko, who was fantastic after he managed to beat Gor Mahia defenders with his pace and impressive dribbling skills. 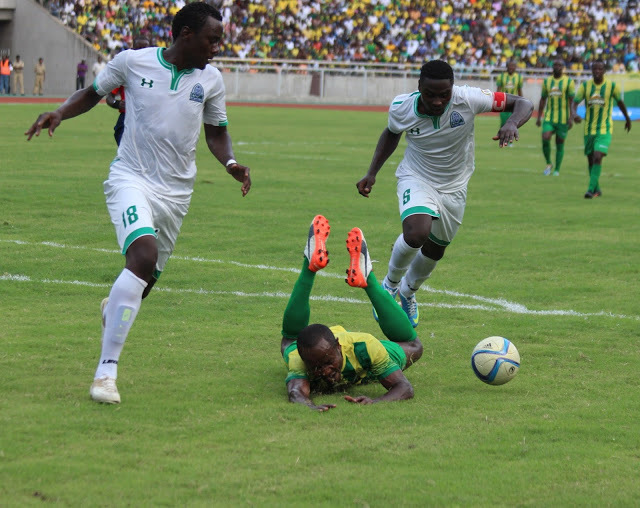 Chemelil went in search of the winner but Gor hang on to dear life and the precious point. “Our dedication and commitment to the development of sports in Kenya continues. 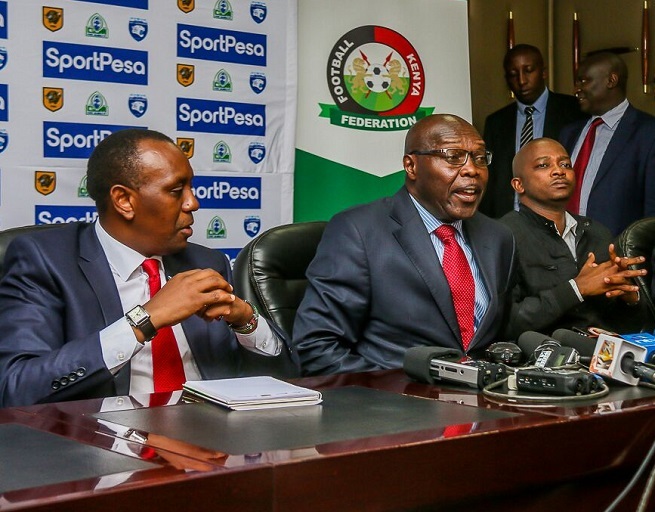 We are proud to announce our return to local sponsorships with these key football industry players.” said Sportpesa in their social media pages. KFF will getof Shs 69 Million, as KPL receives Shs 259 Million. Gor Mahia will receive Shs 198Million and rivals AFC Leopards bag Shs 159Million. The three year deal that Kogalo is getting is higher than the previous deal which Sportpesa signed in 2016. That was for Ksh 180 Million over three years. Gor Mahia and AFC Leopards will face off on May 1. The winner of the match will play Hull City on May 13. Hull City which is now in the English second tier will arrive in the country on May 11. Gor Mahia were originally slated to play Hull City but Ingwe appealed. Hull City beat KPL All Stars in 2016 with Humphrey Mieno scoring the consolation goal for KPL All Stars. Sports PS Kaberia says he is trying to get Kasarani ready for the Hull City match. 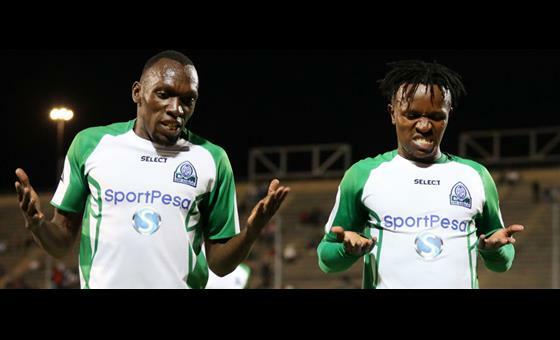 Gor Mahia, having recently been buoyed by their qualification for the group stage of the 2018 CAF Confederations cup, put on a spectacular display when they beat Thika United 5-2 on Sunday. And they had to do it after going behind twice. But their second half masterclass will surely put a smile on coach Dylan Kerr’s face given that he has been worried about his team’s ability to score. NAIROBI, Kenya, Apr 22- Samuel Onyango, Meddie Kagere and Francis Kahata stepped off the bench to score as Gor Mahia regained their spot on top of the Kenyan Premier League standings with a 5-2 win over Thika United at the Kenyatta Stadium in Machakos on Sunday. The game had been tied at 2-2 before Onyango scored the third for Gor in the 74th minute then Kagere took a well taken goal off a counter in the 89th minute. However the cream of the afternoon was left for Kahata who sublimely lifted the ball over Allan Owiny two minutes later for Gor’s fifth. The win saw Gor Mahia move to 25 points, two ahead of second placed Mathare United who lost 1-0 to Wazito on Saturday. K’Ogalo have three matches at hand due to their participation in the CAF Confederations Cup. 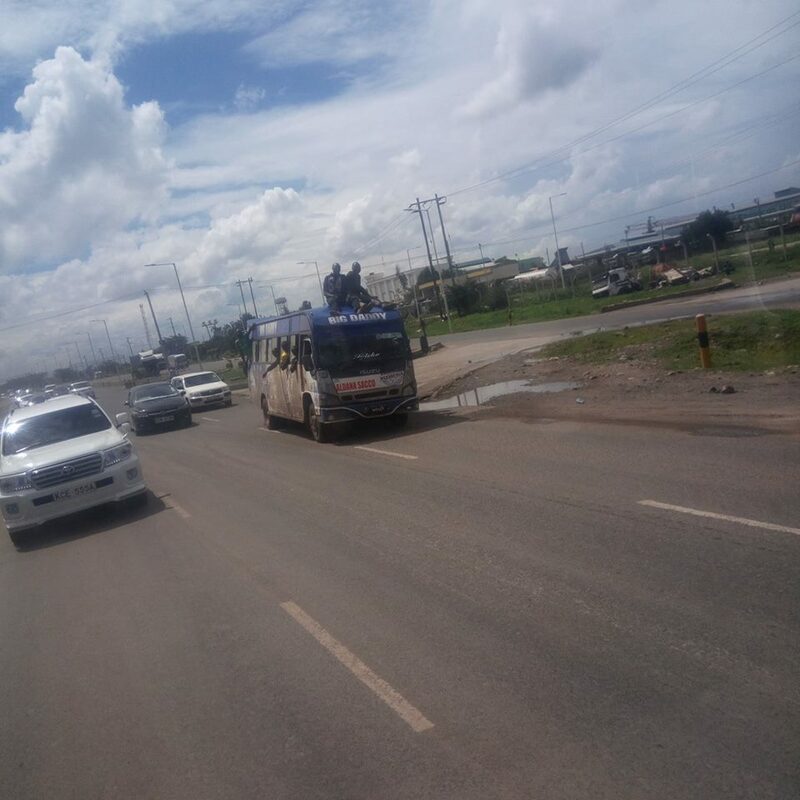 It was a happy ending for Gor with their afternoon having started off with three of their fans perishing in an accident as they travelled to Machakos to cheer on the team. The fans were allegedly precariously hanging on a bus before they toppled off after the vehicle came into contact with another saloon car. On the field, Gor almost paid for some bit of laxity with Thika taking control with a 2-1 lead on the hour mark, but keeper Allan Owiny took the glimmer off teammates Masakidi Mata’s beauty of a freekick after pushing Jacques Tuyisenge’s shot into his own net four minutes later. Gor Mahia ended the opening half with a collective huge sigh of relief, Ephraim Guikan drawing them level with a well taken first time effort after a sleek through pass from Tuyisenge that split the defense. The visitors had gone ahead early in the fourth minute when Eugene Mukangala curled a well taken shot past Shabaan Odhoji who was starting ahead of the rested Boniface Oluoch. Gor Mahia had lost the ball in midfield and when Mukangula was played through, he set himself up with the first touch before taking a shot. Thika had started the match swift with Gor Mahia yet to settle in and after going ahead, they should have added a second when Baraka Badi’s low cross from the right landed on Edmond Adem’s path, but the forward miscued his shot. Despite the slippery conditions of the pitch, Gor Mahia started growing into the game and had a chance with a freekick from the edge of the box on the quarter hour mark but Tuyisenge curled the effort over. K’Ogalo continued to raid Thika as they searched for the equalizer and in the 23rd minute, Tuyisenge accidentally blocked what looked like a goal bound shot from Lawrence Juma who had taken a shot from a Guikan cutback. They came closest on the half hour mark when skipper Harun Shakava’s shot from inside the box came against the crossbar after being put through by debutant Raphael Sudi who had dribbled past a forest of legs at the edge of the box. Four minutes from the break, Innocent Wafula charged down from the right and managed to slap in a low cross, but the ball could only go straight into Allan Owiny’s arms with Guikan salivating at the edge of the six yard box. Gor’s pressure finally bore fruit two minutes to the break when Guikan found the back of the net, Sammy Mejja playing him on side and the Ivorian racing to a Tuyisenge through pass before beating Owiny. Thika were forced into a change at the stroke of half time when Adem was forced out injured with a muscle strain and his place taken by Hansel Ochieng. In the second half, Thika came back with pace again and eight minutes after the restart, Mukangula’s header from a Mata cross went inches over the bar. However, seven minutes later, Mata was wheeling away in celebration after curling a sublime freekick over the wall, the ball bumping in the inside of the post on its way into the net with keeper Odhoji left dumbfounded. But the lead only lasted three minutes as keeper Owiny’s hilarious howler brought Gor back into the game. The keeper first rushed out to cut off an onrushing Tuyisenge but missed the ball completely. As if that was not enough, Tuyisenge’s shot was blocked by Franko Bala, but the keeper rushing back to his line pushed the ball into his own net as he attempted to tip it over. Gor struck the winner in the 74th minute when Innocent Wafula lifted the ball over Owiny on the left and on onrushing Onyango side footed it home unmarked from the right. This was the vehicle that was involved in the accident. Not only were fans hanging on the side, some were sitting on top. Why anyone would sit on top of a moving bus is beyond understanding. Three Kogalo fans perished in an accident along Mlolongo road on their way to the stadium on Sunday. According to the Star newspaper, the victims met their death after the 44-seater matatu they were hanging from passed too close to another stationary matatu on the right-hand side. Mlolongo chief Peter Ndunda said the driver swerved to avoid a head on collision with an oncoming trailer. The other matatu, also a 44-seater, had stopped to pick passengers at a stage in front of Mulleys Supermarket. 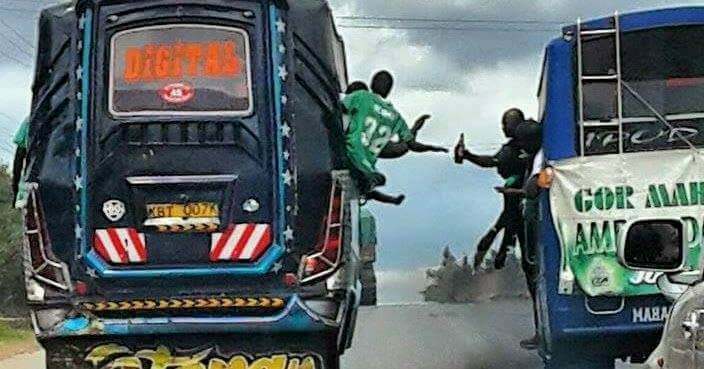 The Gor Mahia fans were squeezed between the two vehicles and fell; two died on the spot. The matatu was ferrying the fans from Kawangware to a match at the Kenyatta Stadium in Machakos town. Other passengers who sustained injuries following the impact are still admitted at Shalom Community Hospital. The driver of the stationary matatu is among the victims who sustained serious injuries. Prior to the accident, club secretary Ben Omondi posted what in hindisght looks like a highly innapropriate message on his social media pages. So sad, this afternoon we lost 3 of our fans through tragic road accident in Mlolongo.
! May their souls rest in peace:- Kelvin Otieno Juma,”Reflector”, Kennedy Omondi “Omosh Wuod alego” and George Otieno. Evans is in critical condition and currently receiving treatment at Shalom Hospital. They are from Dandora Sharp Corner Branch and Young Achievers. We condole with the families which lost loved ones and wished quick recovery to the injured. I join all Kenyans and Gor Mahia Family in praying for the families affected, that they have the strength to overcome this tragedy. Unfortunately these two did not learn from the previous event when another fan known as Jakababa Jakafadhe lost his life. Even after details of the grissly accident spread around, some fans were still misbehaving. And it is not clear why the drivers and the police cannot stop this behavior. The draw for the 2018 CAF Confederations cup is out. Gor Mahia have been placed in group D along with regional rivals Yanga of Tanzania and Rayon Sports of Rwanda. 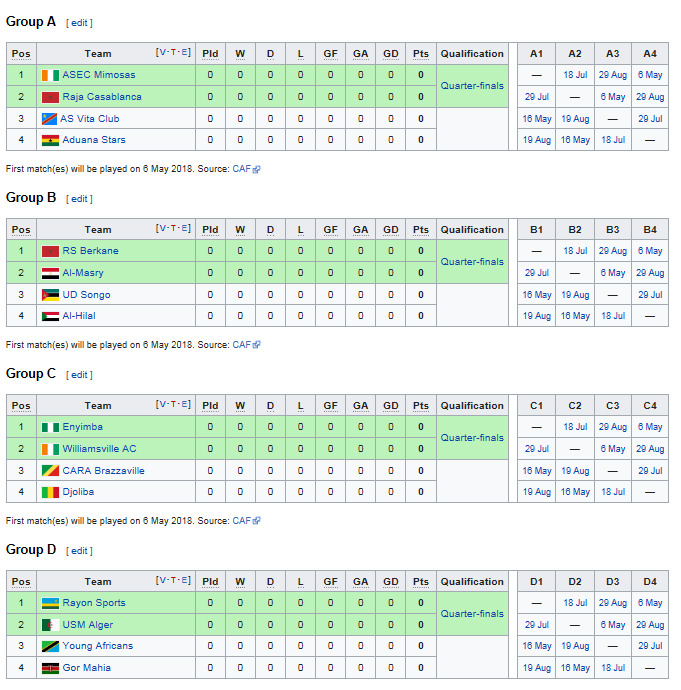 The other team in the group is USM Alger of Algeria. Its a favourable draw that leaves Kogalo an excellent chance at qualifying for the quarter-finals as either group winner or runners up. The draw also makes Gor Mahia’s travel expenses more manageable. Kogalo kick off their campaign away to Rayon Sport on May 6. They will be playing Meddie Kagere’s former team where he played in 2013 and 2014. The team is coached by former AFC Leopards coach Ivan Minnaert. Its redemption time for Kogalo after their massive 6-0 aggregate loss to another Rwandese side APR in 2008. The only survivor from that team is George Odhiambo “Blackberry” who at the time was barely out of secondary school. He had been a star for Kamkunji secondary school in 2007, leading them to the Nairobi City title. And that is where he first made his name. Gor Mahia have played Yanga numerous times, most recently at the 2015 CECAFA cup where Kogalo beat Yanga 2-1 in front of the latter’s own fans. And coach Dylan Kerr knows Yanga well having coached them in 2015. “I know Yanga very well,” said Gor Mahia’s English coach Dylan Kerr, to the Nation. Indeed Gor Mahia’s record against Tanzanian teams has been very good over the years. Gor Mahia will then host USM Alger on May 16. In its long illustrious history, Gor Mahia have never played a team from Algeria. Yet USM Alger are the clear favourites. They were imprresive when beating Plateau United of Nigeria 4-0 in their most recent match. And they were CAF Champions league runners up in 2015. “I don’t know much about Rayon and the Algerian team though. Overall, I expect it to be very tough because everyone wants to qualify for the quarter-finals. I believe in the team and the players, we can do this.” added Kerr. The good news is that unlike Vegeterianos, Kerr will find plenty of video featuring USM Alger matches. “Now that we have got here, there is nothing to fear. We just play the way we know because in that group we stand a very big chance,” added Gor captain Harun Shakava to the Nation. In addition to earning Ksh 27 Million in the group stage, Kogalo could earn another Sh8 million should the team qualify for the quarters. Kogalo stand to gain a total Sh45 million if they progress to the semi-finals, or Sh125 million for going all the way and winning the tournament. They will make a total Sh45 million if they progress to the semi-finals, or Sh125 million for going all the way and winning the tournament. Early preparations are key. Organization with regard to ticketing and other off the field issues will be key. And hopefully the government will give Kogalo an opportunity to play some home matches in Nairobi. Gor Mahia coach Dylan Kerr is elated at being in charge of the first Kenyan team to reach the group stage of any continental tourney. But he knows his work is cut out. “I am really excited and happy for what this group of players has achieved. We have made it for Gor Mahia, we have made it for Kenyan football. The journey has now just began. We want to make a mark in this tournament and take this great football club where they deserve to be, among the continent’s elite,” said Kerr to the CAF portal. Gor Mahia had to overcome a mountain of problems before they played against Supersport. They played without a number of key players including Ernest Wendo who was suspended, Godfrey Walusimbi who has been on strike as well as Ephrem Guikan and Jacque Tuyisenge who were unable to obtain travel visas. “The journey wasn’t easy, but we worked as a team and that’s all that made us qualify despite the challenges. This is history made after many years of waiting. We can’t wait for the group stage. The South Africans came guns blazing from the word go but we contained the pressure and despite conceding an own goal, we gallantly fought on” said captain Shakava to the Nation. And it was poetic justice that Francis Kahata scored the crucial goal as he had originally been denied a travel visa by the South African embassy. “I am happy to be living the dream at this club. I wanted to win the league and help them on the continental front, I am delighted that my goal made the difference” said Kahata to the Nation. Kahata also noted that it is an opportunity for players to put themselves on the market. “It is a dream come true and an opportunity for most of us to market ourselves. We knew they (SuperSport) would come strongly on us, but we remained calm and played our game,” he continued. And it was George Odhiambo “Blackberry” who led the team in assists in 2017, who again provided the all important pass to Kahata. Of the qualified teams, the only sides that Kogalo have played recently are Al Hilal and Young Africans. Gor Mahia also played Djoliba of Mali in 1981, losing 2-1 on aggregate. Ugandan winger Abbey Nassur scored Gor Mahia’s goal from the penalty spot at the City stadium but it was not enough.